MOST PEOPLE in astronomy are amateurs, some of whom make a name for themselves through devotion to their favorite pastime. A few are professionals, teasing the frontiers of knowledge with high-tech telescopes. In his long career Alika Herring was both an amateur and a professional, walking the narrow path between the two. In his quiet, unassuming way he made his mark in astronomical history. My article on Cave Optical Co. (S&T: August 1994, page 88), Herring's former workplace, prompted me to search for my long-lost friend. I tried to locate him in Southern California and failed. But soon after my article was published, many people I hadn't heard from in years suddenly materialized, including Herring. His letter arrived from Anaheim, California, bearing an invitation to visit. Herring told me later not to expect the keen-eyed observer he had once been. He was suffering from macular degeneration in both eyes, forcing him to set his telescope aside and end his mirror-making days. All he had left were the memories, which I wanted very much to capture. When I arrived Herring greeted me as a dear friend and beckoned me into his study. His failing eyesight hadn't dampened his lifelong love for astronomy. Yet now, he said, he had turned to music, his second love. He handed me a card that read, "Alika Kamalaniokeaukaha Herring, Hawaiian Steel Guitar." "All I have left is my music," he sighed. "I'm making recordings now -- I have five albums out." Then he placed a tape in the stereo, and romantic strains of Hawaiian music filled the room. What an incredible spirit, I thought. As the music played, Herring turned back the pages of his personal history, and I learned much about this master of glass and the sky. I first met Herring in the summer of 1953 at Cave Optical in Long Beach, California. Tom Cave had hired him to figure mirrors, something that was to have an important influence on me, a starry-eyed kid of 15 at the time. Herring taught me the sometimes mysterious ways of mirrormaking, priceless lessons I have never forgotten. In the beginning Herring made mirrors under the most primitive conditions. Every morning he would begin work in the unheated one-room shop. Temperatures would be as low as 40 degrees Fahrenheit when he started, gradually warming up as the day wore on. This played havoc with the pitch laps, which in turn made control of the figuring operations very difficult. Many times I saw a frustrated Herring return a mirror to the polishers to remove a turned edge or a "hole" in the center. In those days black coal-tar pitch was the lap material of choice. It was a day of celebration when Herring talked Cave into changing to Zobal pitch, which gave far better control of the figure. Still, conditions remained marginal for producing good mirrors until a new room was added to the shop, allowing the figuring table to be moved away from the grinding operations and permitting some control of the room temperature. All of Herring's mirrors had very fine figures, and some were extraordinary. While researching this article I was contacted by Richard A. Buchroeder, a leading optical designer and long-time friend. Buchroeder had recently acquired an 8-inch telescope with a Herring mirror. He was well aware of the "legendary" Herring mirrors made in the '60s and '70s, and he had always wanted to put one to the test. Buchroeder's results substantiated what I already suspected: Herring's mirrors are among the finest. In 1955 Herring made a personal 12 1/2inch f/6 Newtonian telescope that he used for four years. Although its mirror was quite good, he was not satisfied, and in 1959 he began work on a replacement. Interestingly, he sold the telescope's original mirror to Cave, who mounted it in his own telescope -- a testament to its fine quality. Herring worked on the new mirror after regular business hours. He labored over it much as a composer struggles to create a new symphony. He would let the mirror rest for hours to thermally stabilize and then return it to the tester. Once, when he thought the mirror was completed, he took it home and mounted it, unaluminized, in the awaiting telescope. The star tests were good, but not good enough. After slightly more correction in the shop the "super mirror," as Herring calls it, finally materialized. It seemed near perfection -- the best mirror he had ever made. "You ask how good is the mirror?" said Herring in The Astronomical Centers of the World by Kevin Krisciunas. "Frankly, I don't know. The figure has failed to break down under any test that I have been able to devise for it. I do know that the mirror gives exquisite performance and surpasses anything else of equal size that I have ever seen. During the years I made telescope optics I made over 3500 paraboloids, but I don't think I ever topped this mirror. It is truly one of a kind." Mounting the mirror on a Cave Astrola German equatorial, Herring put the telescope to immediate use observing and sketching the Moon. At this moment all his talents -- as accomplished artist, mirror-maker, and visual observer merged. Very soon the combination of skill and hardware drew increased attention from this magazine, which published his drawing of the lunar walled plain Posidonius in the July 1958 issue, beginning a series that would last nearly 10 years. The late 1950s to early 1960s was a busy time for those lucky few involved with America's struggling space program. Earth-based lunar observations were urgently needed if we were to reach the Moon. Gerard P. Kuiper, director of the University of Arizona's fledgling Lunar and Planetary Laboratory (LPL), needed someone with artistic talent and a keen eye for detail to help with lunar mapping. Herring was that individual. On September 29, 1961, he bade farewell to Cave Optical and moved his family to Tucson, Arizona. When Herring arrived at the laboratory he was immediately put to work as a research associate in lunar cartography. He concentrated on the poorly mapped lunar limb, observing with his 12 1/2-inch Newtonian during times of favorable lunar libration. These first observations were made from Tumamoc Hill in the Tucson Mountains five miles west of the University of Arizona. Herring's telescope was installed in a building with a roll-off roof. It became LPL's first observatory when completed in early 1962. Herring also conducted seeing tests at Tumamoc Hill, as this was a prospective site for several smaller telescopes. But by July a site became available in the Catalina Mountains to the north, overlooking Tucson. In the fall of 1963 a 20foot test tower was built there on the site of what was to be LPL's main observatory. Herring's 12 1/2-inch was installed in the tower, and he conducted seeing tests while continuing with his lunar limb work. This testing continued until late spring 1964, when Kuiper became convinced that the site was adequate, though by no means superior, for a planned 61-inch telescope. The economy of placing a large instrument close to home was an overriding factor. The Catalina 61-inch telescope, the largest in LPL's inventory, became operational in October 1965. Using this instrument Herring and several other LPL observers conducted an intensive program of lunar photography every clear night. Many thousands of images were taken, from which 225 were chosen to become the Consolidated Lunar Atlas, completed in 1967. It remains the finest groundbased photographic lunar atlas ever made. Herring's site-testing work in the Catalina Mountains was overshadowed by a much grander project, Kuiper's desire to discover the best site in the world for a large lunar and planetary telescope. It was Herring's destiny to find that site. About this time a curious coincidence set the stage for future events. Howard Ellis, an atmospheric scientist staffing a weather station on the slopes of Mauna Loa, happened to mention to Mitsuo Akiyama, executive secretary of the Hawaii Island Chamber of Commerce, that Mauna Kea might be an excellent site for astronomical telescopes. Thinking of the economic future of Hawaii, Akiyama sent letters to dozens of astronomers worldwide, on the chance that Hawaii's unique location might interest them. Astonishingly, Akiyama's effort attracted the attention of only one astronomer -- Kuiper. Of the various volcanic mountains in the Hawaiian Island chain, only 10,000 foot Haleakala on Maui had an access road to the top, for the University of Hawaii was building a small solar observatory there. Thus Kuiper chose Haleakala as the first site to test. Moreover, the dome for the solar observatory was in place, but the equipment wasn't ready to be installed. In the fall of 1962 LPL obtained permission to use the dome temporarily for site testing, and Herring was chosen for the task. LPL had built a 12-inch site-testing telescope, but Herring insisted his own mirror be fitted into the instrument. Over the next several months Herring conducted observations from Haleakala. "Between seeing tests that I would make about every 15 minutes," said Herring, "I would observe the Moon and Jupiter. At times Jupiter was like an etching, so still that I would often count 30 seconds before I could detect any motion whatsoever. I saw detail that approached the Voyager shots." But Haleakala was rejected, not because of the seeing, but because of the mountain's summit altitude. The 10,000 foot peak is just at the top of an inversion layer. Moisture-laden trade winds often cap the peak with a layer of clouds, and the large caldera acts as a reservoir for cold air, forming fog that frequently gathers around and spills over the summit. During such cloudy periods on Haleakala, Herring would look across the ocean to the Big Island. There, projecting above the cloud deck, were Mauna Loa and Mauna Kea, both well above the inversion layer. At that time the 13,800-foot summit of Mauna Kea was inaccessible. However, a visit by Kuiper to Hawaii's governor soon resulted in funds to construct a road to its peak. In May 1964 NASA provided financial support for the construction of a small observatory for site testing on Pu'u Poli'ahu, a cinder cone a mile west of the summit. Once again Herring was the chosen observer. During my interview Herring's eyes would become expressive with excitement as he remembered great moments on Mauna Kea. "I used to cry about that seeing. During times of perfect seeing, you're held spellbound. You start to make a drawing and you forget what you were doing. I just never got enough of the Moon. I regularly used 619x." The excellence of the seeing was evident when Herring observed his favorite test object, Gamma-2 Andromedae. The separation of this close binary star was 0.4 arc second at the time, which he could regularly elongate. He could nearly separate the Airy disks, matching the theoretical limit of the telescope. Herring used a qualitative seeing scale from 0 to 10, with 0 being very poor, 5 good, and 10 perfect. The last designation meant that the seeing was perfect for many minutes without the slightest interruption. Seeing of 6 produced diffraction rings around the brightest stars, and perfect seeing revealed diffraction-limited disks surrounded by six diffraction rings. Later measurements were consistent with Herring's results. He also kept careful weather records, especially of the watervapor content over the site. At this altitude most of the water vapor is beneath the summit, making Mauna Kea ideal for infrared observations. As the test results became known, interest in Mauna Kea increased rapidly. On July 20, 1964, only a month after Herring had begun his work, a delegation of some 200 people gathered for a ceremony to dedicate the new road to the summit. During that dedication Kuiper emphasized what Herring was already discovering and what the astronomical world was beginning to appreciate. Over the next 18 months, Herring made three additional trips to Mauna Kea, each lasting several weeks. Meanwhile, the University of Hawaii became seriously interested and sent its own site-testing team to the summit. Herring collaborated with the team until he left for the final time, on February 13, 1966. Ironically, though he and Kuiper had revealed this magic mountain to the astronomical world, this site was not forKuiper to have or to share with others. The "jewel" was passed to the University of Hawaii, and the rest is history. Herring continued to test other sites. After visiting Cerro Tololo, Chile, in 1965, he told Kuiper that the best seeing there was inferior to that on Haleakala. This prompted Kuiper to drop Chile and look elsewhere. Other sites were tested in the western United States and Baja California (for the University of Mexico), but none compared to Haleakala. In fact Herring concluded: "Although I cannot prove this, I had the impression that the very best seeing on Haleakala was better than the very best seeing on Mauna Kea." By the late 1960s the entire climate of lunar studies had changed. The Ranger and Surveyor spacecraft had made their marks on the Moon's surface, and the Lunar Orbiters had expanded on much of what the Consolidated Lunar Atlas had offered to the Apollo program. Herring finished his limb drawings; the job was ending. Herring resigned his position at LPL on March 1, 1970, and moved back to Southern California. Two months later he was back at his old job at Cave Optical. He returned briefly to LPL in September 1971 as guest observer on the 61-inch during a close opposition of Mars. In 1972 Herring began making small telescope mirrors in his home shop. Although he was in direct competition with Cave Optical -- he even advertised in Sky and Telescope -- Cave never objected to his moonlighting. Herring's finest mirrors were probably made at home during this period, and, unlike his Cave Optical mirrors, these were signed. For the collector a word of caution is in order. He claims that some of his mirrors were "faked" and that there are "people out there in mirrorland who have counterfeit Herring mirrors." Authentic ones have a coded serial number scribed on the back. Not surprisingly, Herring carefully guards the code and would not reveal it to me. 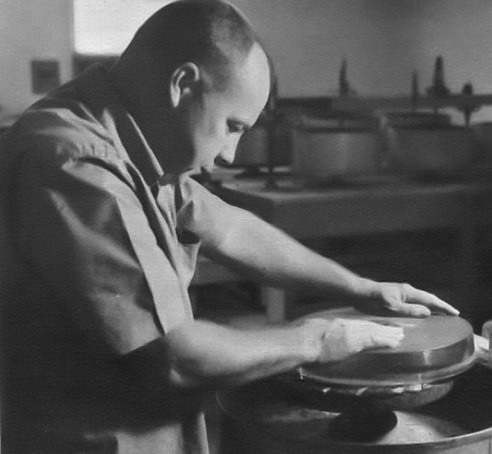 Herring continued making mirrors for Cave until his retirement in 1979, just months before the company itself shut down. He worked at home until 1980. Curiously, both Cave Optical and "Herring Optical" ended in the same year. An era in American telescope manufacturing quietly came to a close. The Hawaiian music ended and Herring put on a new tape. I took a few pictures, chatted a bit longer, and then reluctantly left him to his music and a very different life. The "super mirror" that had served astronomy so well no longer points skyward but retired with him and is kept lovingly in a box in his study. Herring was a loner in the business of site testing, and he preferred it that way. But he had carried a burden for years that he revealed to me only late in our conversation. "I shudder now when I think of the responsibility I had. Millions and millions of dollars hung in the balance, and it all was pretty much on my say-so. It scared me." No more a burden, Alika, I thought. You were right on target. The world of astronomy owes you a debt of gratitude for a job well done. Copyright of Sky & Telescope is the property of Sky & Telescope Media LLC and its content may not be copied or emailed to multiple sites or posted to a listserv without the copyright holder's express written permission. However, users may print, download, or email articles for individual use.